Hello there readers. Welcome to this weeks Read With Me. I hope you've managed to find some time to read whether it be by yourself or with your children. I can't believe we've reached March already. 3 months into the year and I've already got a third of the way through my goodreads challenge, go me!! 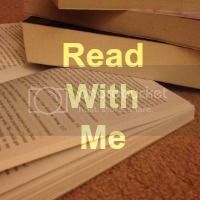 Last week I sped my way through a series of books that I have been meaning to read for quite some time. If you are a fan of books like The Hunger Games and Divergent I urge to read Jennifer L Armentrout's Lux series. This set of books goes along the lines of paranormal romance. We follow Daemon and Katy and many other well written characters as drama ensues. Now my favourite post from last week came from kid GL loves, sharing their visit to the Roald Dahl Children's Gallery, this is a place I'd love to visit!! Onto the link up. If you are new to Read With Me, take a look at what it is all about here. Regular? Get linking, commenting and hopefully displaying my badge. I cannot wait to take my baby girl to the Roald Dahl Childrens Gallery, lots of childhood memories in his books for me. Thanks for hosting - we love reading here. Well done you on your goodreads record!!! I love that style of books but not heard of the Jennifer L Armentrout's Lux series so will look out for those!